Happy February, sweet friends!!! Hopefully, your month is off to a fantastic beginning. This week on the blog is all about Valentine’s Day. I am participating in two different blog hops that are sure to get you ready for the big day. The first one is a vintage inspired Valentine’s Day and the second one is a Valentine’s tablescape blog hop. I will be featuring my table tomorrow, but for today I want to invite you to a vintage inspired Valentine’s Day tea. 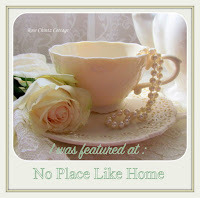 This fun vintage inspired hop is being hosted by my blogging friend, Amber, at Follow the Yellow Brick Home. She has a gorgeous home and loves vintage treasures a much as I do. Why don’t you come in out of the cold and enjoy a warm cup of tea and some friendly conversation? If you are visiting from Decorate and More with Tip, welcome! I am so happy that you stopped by for a visit. Today’s tea is a mix of vintage items with an emphasis on Valentine’s Day. Gracing the tea table, you will find my silver service. I love any excuse to use it! Bouquets of pink roses are placed throughout the table to add a pretty touch. Lots of vintage teacups are scattered about to enjoy a delicious cup of tea. An Ex Voto is placed on the tea table to join the other vintage items. It was a gift from my sweet Valentine, Mr. Bleu. The sacred heart is from France and has an antique French bible page attached to the inside. The history of the French Sacred Heart can be traced back to the 11th century. They were used and continue to be used today to carry devotional objects and to give thanks for granted wishes, prayers, and intentions. This weekend, while antiquing, I found this precious cherub clock. It is very old, and in in dire need of repair. However, I adore clocks and just couldn’t pass it by. I have a collection of antique clocks. Not all of them work, but I still admire them for their craftsmanship and beauty. They make wonderful additions to French Country vignettes. I am so happy that you joined me for a visit this morning. Be sure to stop back by tomorrow to see my Valentine’s Day table. A list of both blog hop schedules is posted below. I know you will find lots of beautiful Valentine’s Day inspiration. May you all have a happy and blessed day!!! Shannon I am so very happy you were able to join us for this hop, as this post is simply gorgeous! I love your pretty tea cups and all of the gorgeous vintage treasures on your table! The sacred heart and the beautiful bouquet are exquisite! Thank you so much for joining this hop. Happy Valentine’s Day! What a pretty tea! Love your vintage clock. Oh Shannon, this is so lovely! I think silver and pink roses are meant for each other, and your beautiful tea cups are so perfect on your tea service tray. The French Sacred Heart is just incredible, how beautiful! Shannon I love your tea party table. Love the silver tea set and those beautiful tea cups. You have some beautiful vintage sacred items. Love doing the blog hop with you! Happy Valentine’s Day! Your tea looks so lovely, Shannon! You have some truly wonderful pieces…eye candy! It was fun being on the hop with you! Shannon, your tea is simply lovely. Your clock is a wonderful find. There is something about cherubs I adore and I wouldn’t have passed it by either. Oh, the thrill of the hunt ~ one never knows what they will find. ps. I have my mom’s silver tea service. Your lovely posting has inspired me to get busy polishing hers. Happy day, sweet friend! What a lovely table you set for a tea party. Your silver tea service and tea cups are perfect for a Valentine’s Day celebration. Your cherub clock was a great find and I enjoyed learning about the use of a sacred heart. Perfectly romantic setting for Valentine’s Day… I love looking at home each and every time. Wow, I’d never seen or heard of a sacred heart before. How precious is that?! Now I’m on the hunt for one. Your tablescape is beautiful as always. Seems like you had great fun putting it together. Hope you have a wonderful Valentine’s Day. I love your beautiful table setting, Shannon–just my style for a vintage tea. You have so many pretty pieces and they go beautifully with those gorgeous pink roses! Happy Valentine’s Day! Shannon, Your clock is beautiful! Who cares if it works or not-it’s art! And of course all your teacups with roses are lovely. You’ve got a busy week! Happy Valentine’s! Love your vintage tea service and table. The beautiful sacred heart has an intriguing story and would make a great conversation starter. Very romantic gift too! I love your tea cups and tea service!! So pretty! I also love that Sacred Heart! So special!! Beautiful post! Shannon, this is lovely! How special to have the French Ex Voto from your valentine! It is a lovely piece. The cherb clock is a stellar find. It has some fabulous details. Kudos to you and your sharp eye! Happy Valentine’s Day! The sacred heart and the cherub clock are perfect on the table with your elegant tea service. Shannon, it’s so good to visit you again. I love everything about your vintage tea party: the lace tablecloth, the beautiful china, the silver service, the candelabra and all the little touches. The pink roses are beautiful. I’d love to be invited. See you on the tablescape side. What a gorgeous silver tea set and table. Love your fabulous heart box too. I thought I had commented on your lovely vintage tea table! It is beautiful, and I adore the cherub clock you found. What a beautiful silver tea set and chinaware. The vintage heart and clock are lovely also. I’m sorry I missed linking up at your Vintage blog hop. This is all so beautiful!! I LOVE the silver tea set!! It is gorgeous!! The tea set and china are all beautiful, and I just love all the extra vintage touches around the table. Also, thank you for the use of the expression “ex voto.” I had no idea what it meant, so I looked it up as well as the phrase “votive offering.” Always a delight when one can enjoy a lovely post and learn something as well! All those vintage treasures are just perfect for Valentine’s Day vignettes! I always leave your blog inspired!